With more spring storms in the forecast, leaders at Fort Worth’s MedStar Mobile Healthcare aren’t taking any chances when it comes to taking on more storm damage. 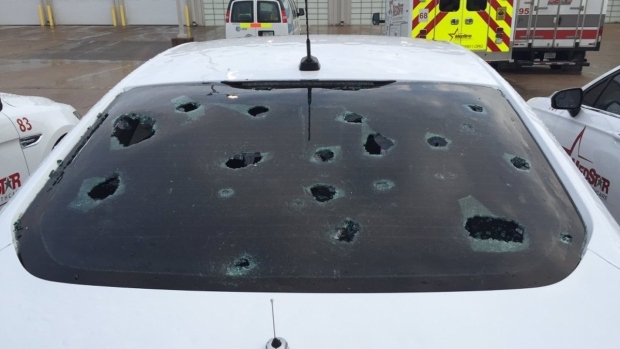 On March 17 the company’s headquarters in West Fort Worth was hit hard by a massive morning hail storm that employees said dumped tennis ball-sized hail on the area for just 10 minutes. In that time, most of the vehicles in their parking lot suffered dents and shattered glass including employees’ personal cars. MedStar said 11 ambulances and support vehicles were totaled with several others still waiting in line for repairs; including some that the company has no other option but to pay up and have repaired. Severe storms that struck North Texas early Thursday morning damaged about 70 percent of the vehicles in MedStar's parking lot, according to spokesman Matt Zavadsky. "The ambulance chassis aren’t made by the manufacturer anymore,” said Public Affairs Director Matt Zavadski showing the dozens of dented chassis in the company’s back parking lot. “We bought all the chassis in the country, you cannot replace those." Zavadski said those chassis, which will go into use when older ones need to be retired, also suffered major damage to their battery boxes and other components that they are left to repair. Additionally, MedStar’s facilities, which only opened a little more than a year ago, suffered major damage to the roof and siding; all of which is in line to be replaced still. It will likely be some time before the company can budget through each of those repairs. In the meantime, Zavadski said they still have plenty of vehicles to meet patient needs, and the company has also implemented new weather policies as a result. In addition to improved communication during storm warnings, Zavadski said they regularly hold drills now to prepare to bring every single vehicle into the facility’s indoor bays and hangar areas, including employees’ personal vehicles, before severe weather hits. MedStar also urges the public to prepare ahead for severe weather. The company’s first-response teams regularly deal with storm-related injury calls during severe weather. Zavadski said the most common are vehicle accidents resulting from drivers parking under overpasses on the highway during storms, and hail injuries to the head and body. His advice is to just stay inside and take cover until the storms pass, if you can.